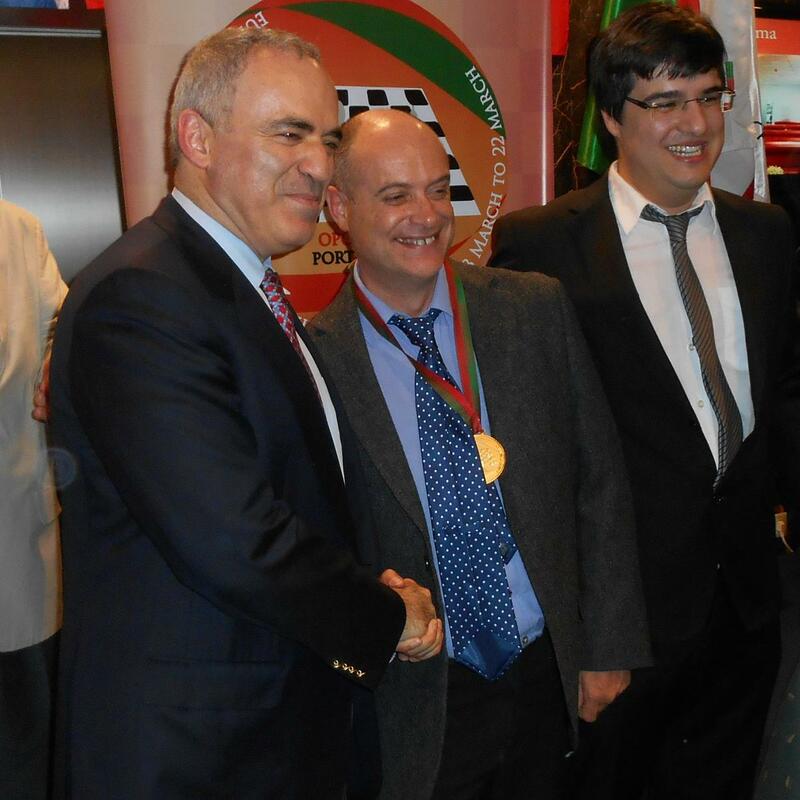 On the night of the 26th February in the hallowed halls of the Anvil, Hammersmith Chess Club will host one of the most original and finest grandmasters this country has ever produced. 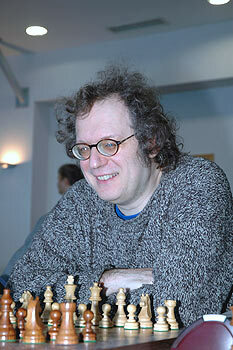 GM Jon Speelman is not only a world championship semi-finalist, he is a great analyst, journalist, mathematician and writer. His games are some of the most original on record. The evening will consist of Jon analysing one of his games and commenting on his thought processes and strategy goals as he progresses through it. 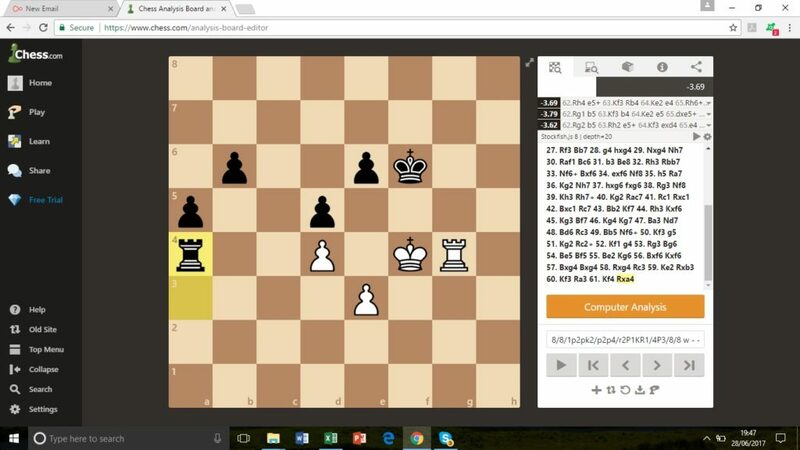 It’s a unique chance to see how a world class chess player prepares for their opponent, what factors influence the critical decision-making process, his state of mind at various points in the game, and much more. 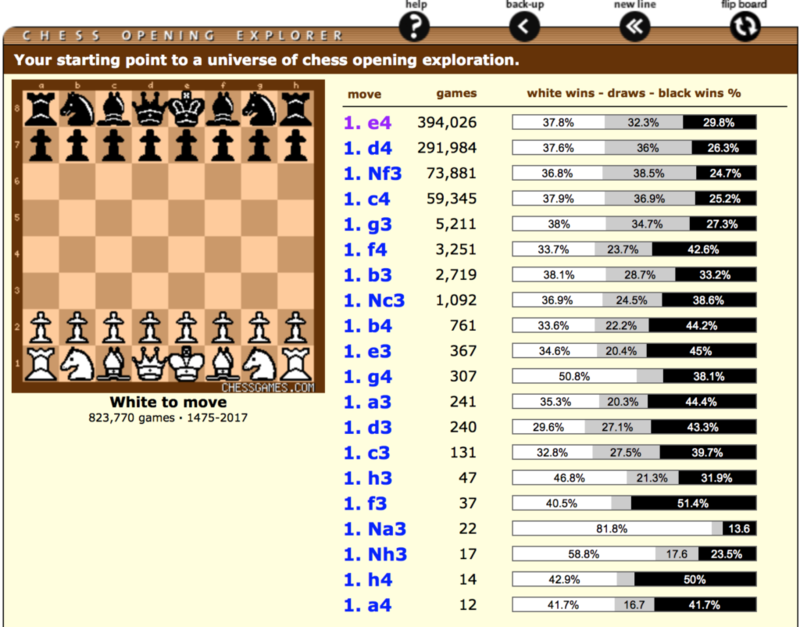 This will make you look at your chess approach in a totally different way and help you develop as a chess player. The analysis part of the evening will then be followed by a Q&A session- your chance to ask any question of a top chess professional. Plus, we have a very special offer for Hammersmith members. As one of the most prestigious events we’ve hosted to date, it’s likely to sell out in advance so we have introduced an EarlyBird offer – if you signup before 31st January, you’ll also get a discounted entry fee. It pays to be pro-active!! No Bruce Springsteen this week, but the Glory Days are very much here as we travel headlong towards The Promised Land. Read on! On Monday Hammer’s 2nd team were back at Lytton Hall to face Hendon 5 – a junior team often known as Hendon Barnet Knights. On paper we out-graded them by a whopping 35 grading points on average, but as with all juniors they were expected to punch above their weight. It didn’t go well on the top boards. Sheikh and Matteo, often first team call-ups, were brought in to bolster the lineup. They both blundered pieces early on and resigned, leaving us 2-0 down. 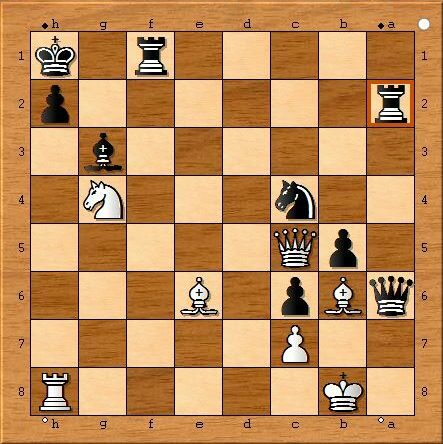 “I played the Sicilian O’Kelly/Tartakover variation, pressurising white’s centre with an early e5 and Bb4 to pin white’s knight defending e4. My opponent overlooked a tactical trap on move 8, losing his knight for two pawns. But he made good use of his two bishops to support his menacing d-pawn advance. 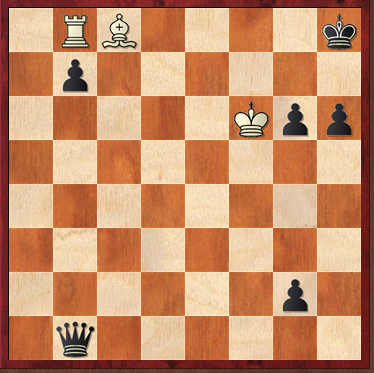 To eliminate that pawn and complete my cramped development I had to sac my two q-side pawns. 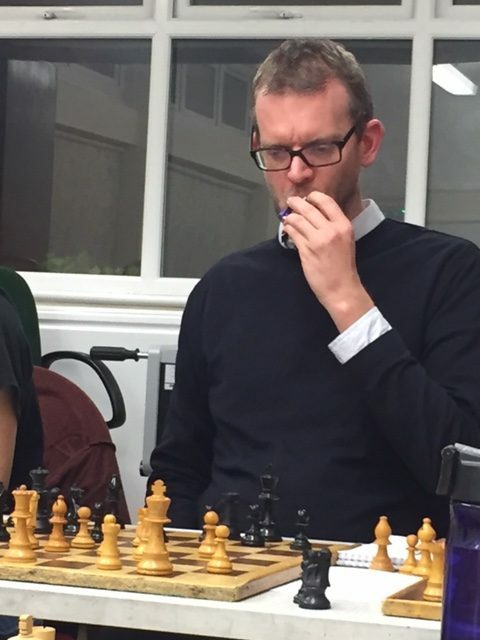 Board 5 saw Simon employ a version of the London System recommended by his namesake, Ginger GM Simon Williams. 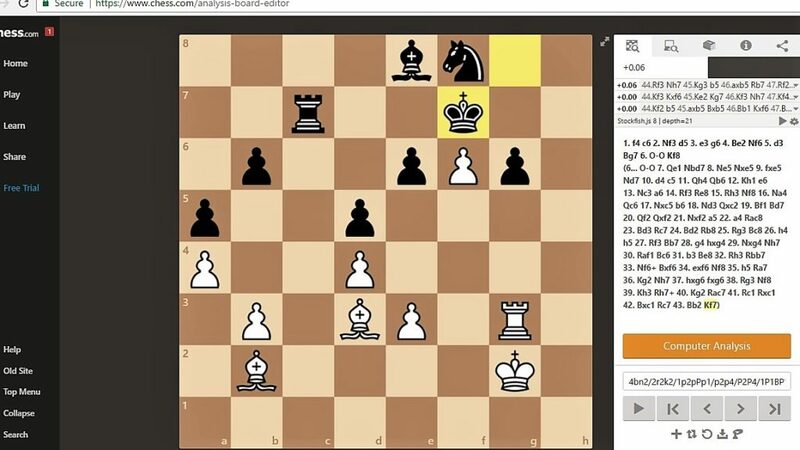 Known as the “Black Half-Asleep Variation”, Simon planted his pawns on d4 and e4 with a knight on c3, against a king-side fianchetto. He soon eliminated black’s menacing dark-square bishop and seized a strong positional advantage. Simon couldn’t find a clear route to victory, however, and his opponent fought back well. Pieces got exchanged and the game boiled down to a draw. By his own admission, Dipender played a very disappointing game. He lost a piece early on and never really got back into it. It was as if he had other things on his mind – possibly his wedding this weekend! A big congratulations – we wish him well on his honeymoon and hope to see him back at the chessboard stronger than ever! Ken got extremely lucky on board seven. He offered a draw in a losing position with far less time on his clock. His opponent, possibly considering the grade difference rather than the position, kindly accepted, leaving us 3-4 down with one to play. It was down to Ben, making his debut for the club, to come up with the goods on board 8. He did so in emphatic style, playing a very good game to wipe his opponent completely off the board. So for the second match in a row we ended with a slightly disappointing draw. We remain top of the table, but this has to be qualified by the fact we’ve played two games more than our closest rivals, and we have the toughest fixtures still to come. Ken drops level with John as MVP (I’m not giving the accolade to anyone having played just one game). Sheikh, Matteo and Ben bring the number of members to have played this season up to 19 at the half way point, closing in on last season’s total of 28. Next up is Kings Head 2 away on 13th December. On the same evening, our first team also scored a 4-4 against Hendon. Full report to follow! Monday 27th November – club legend & Middlesex 3 Captain Pickle (aka Adam) will host a session specially designed for players around 100 ECF or below. It’ll be a shorter session than Marios’s, allowing time afterwards for people to play their RapidPlay Round II matches, if they wish. Session starts at 7.30pm, running for about an hour. Can You Topple the King of YouTube? Well now you can find out! 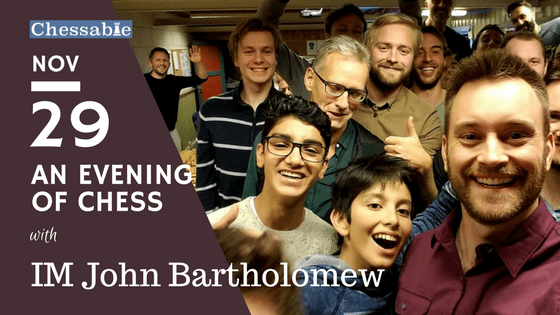 Our good friends at Battersea Chess Club will be hosting IM John Bartholomew on 29th November for an evening of chess! It all kicks off at 5pm at their Battersea Labour Club home, full details are available on Battersea’s Website. It’s FREE and you don’t even need to be a Battersea member! The learned minds at Hammer Chess have decided to branch out beyond the 64 squares of the chess board and take part in a pub quiz later this month! 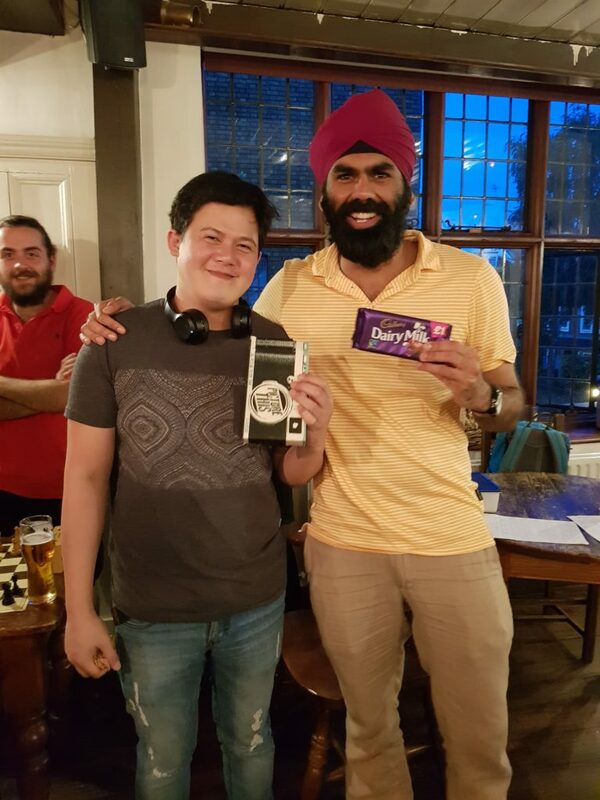 We reckon there’s enough general knowledge there to give anyone a run for the their money (a test run last week resulted in a respectable 2nd placed finish – firm foundations! ), so we’re going to have a crack at one of the local pubs in Hammersmith. The more the merrier! Quiz starts at 8pm (drinks at 6!) – see you there! That’s all for now – plenty of games this week and next, more updates soon! 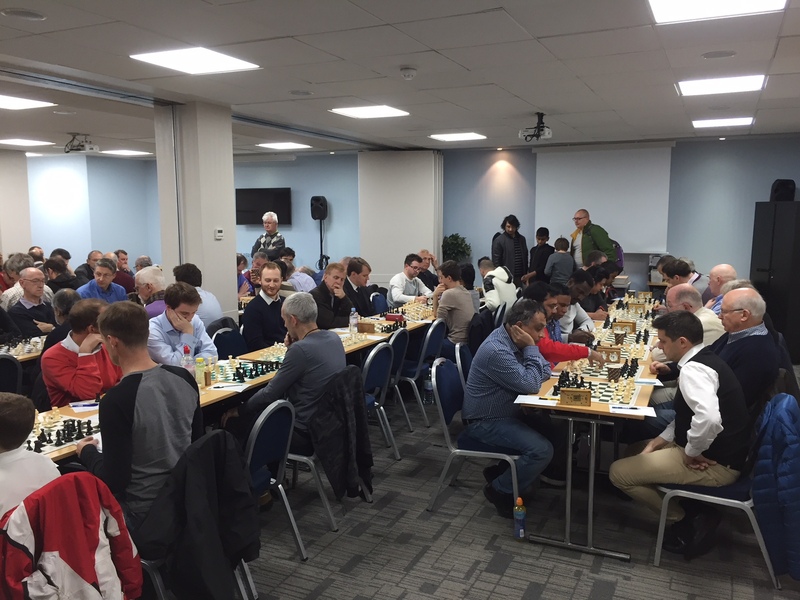 Another bumper week of chess has just flown by – four big games, and a whole bunch of important reminders and updates for your perusal. There’s plenty of things coming up the next few weeks too – including the return of our training programme – so please read on! 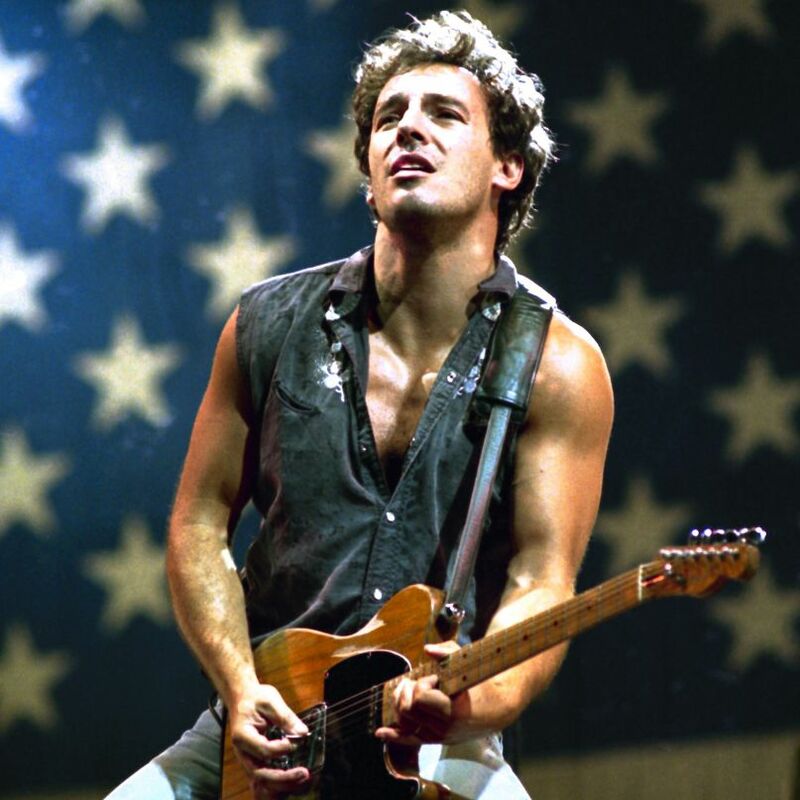 Yes dear reader, Bruce Springsteen has now been dragged into the Hammer orbit. However, it is totally justified in this case as Hammer 1 – Middlesex variation- totally “Bossed” Hendon 4 at The Anvil last night. The Hendon crew came down to The River (Thames) and into the River they dived. They did not surface. 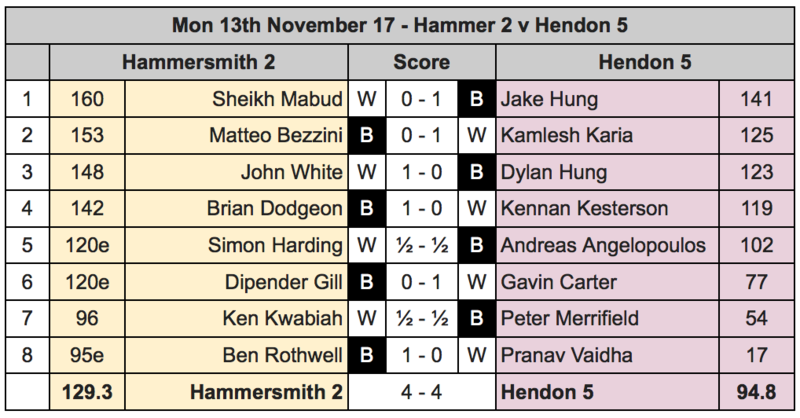 The Hammer posse were in imperious form last night as they swept, Fischer-style, their Hendon opponents 8-0 and thus continue their regal progress in Division 2. 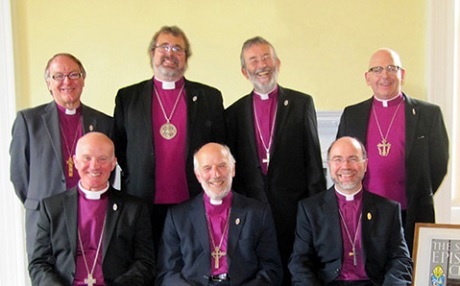 The Hammer team, in board order, lined up as follows – The Surgeon, Zeus, Wily, Brexit, Spock, Tellit, Dead-Eye and on board 8 your humble correspondent Clueless. The following report comes with a caveat in the sense that Clueless was so involved in his game he did not see much of the carnage that took place. I definitely recall Wily being in scintillating form and briskly dispatching his opponent with barely an hour gone. Other victories swiftly followed in the form of Tellit and Dead-Eye. The latter having an awkward game where he was under some pressure. Unfortunately, his opponent moved too quickly, misreading a taking sequence and dropped a rook. Dead-Eye pounced and was the model of sympathy afterwards. Clueless got in on the act with a well-played game where he explored the themes of space restriction, castle prevention and black-square weakness. I actually utilised an excellent piece of advice, courtesy of Zeus – when you have an edge, do not rush matters – just keep improving your position. I can vouch that Mount Olympus advice is worth following. Next to join the party were Spock, Brexit and The Surgeon. Spock had a game that saw action on both sides of the board. I have some memory of his opponent’s king being hunted down by two bishops, rook and queen. Serious weapon deployment and on a semi-open board, the result was never in doubt. Brexit was the beneficiary of a complete blunder by his opponent who advanced his pawn leaving his rook en-prise. Brexit pounced and clocked up another Hammer win. To be honest Brexit was strategically winning at the time (unlike in real life! #political) and would have won eventually. As for the Surgeon, he had a study-like win in a pawn and king endgame. Playing precisely and accurately, like the good surgeon he is, the win was safely delivered. Finally, to Captain Zeus and his well-known opponent and all-round top guy – Mo from BBCA – appearing for his second club, Hendon. All I can report is it was complicated with heavy pieces operating on an open board. Somehow, I guess it is sheer talent, Zeus had it all under control and duly converted, completing the 8-0 scoreline. This means that we are 4-0 at this stage of the season and real contenders for promotion. The force is strong at the Anvil!!! This was the fifth match in Middlesex Div 3 for the Hammer second team, and the closest so far. Thanks to everyone for turning up to the right place and on time. Ealing’s venue isn’t the easiest to find, and it was the first trip there for many of our team. Your reporter was up on board 1, and like John was faced with Bird’s Opening. Not knowing the opening well, I elected to play my tried and trusted London setup. Although not ideal against a Dutch setup (see: Glorious Revolution), I was not being beaten as much as my opponent would have me believe in the post-game analysis, with the computer suggesting a roughly equal evaluation. At the end of the day neither team really deserved the win, with careless blunders and poor time handling settling several of the games. Next up is Hendon 5 on Monday 13th, a junior team that always seem to punch above their grades. It promises to be a tough encounter. We were back to winning ways in Division 4 this week with a fine 5.5-1.5 victory against Alfil at the Citadines. It was our Division 4 debut at our new Hotel venue and whilst we didn’t quite need ‘oxygen tanks’ as one of our members suggested, it wasn’t far off! There were SIX separate matches playing simultaneously, so breathing space was at a premium. Fortunately the Hammer crew have evolved to thrive on pride and passion (and maybe biscuits) instead of mere oxygen. The cramped conditions worked in our favour as we ran out comfortable winners. The setup didn’t make it easy to spy on other games so some of my comments are a bit threadbare. Thankfully I’m able to supplement the commentary with a few PGNs from the evening. Hope you enjoy. First to finish were John and Simon who each notched up wins in quick fire time. I didn’t catch much of John’s game, although his position looked comfortable without being dominant when I glanced over. Things must have turned quickly though, because the match was soon over. John’s our current Div4 MVP with 2 wins out of 2. Great start to the season. Dan was next to finish, chalking up another win for Hammer. Full credit is due for playing a strong game amid the chatter (and whistling coffee machine) of the anteroom. The squeeze in the main room meant it was difficult to find space for Dan’s game. When I started to watch, Dan was a minor piece and a bunch of pawns up! (think I stopped counting at 3). His young opponent graciously resigned rather than prolong the agony. 4.5-0.5 and the win was secured. There was a little reorganisation required before we could conclude the results from Boards 1 and 2. Matteo was a late dropout, scheduled as our #1, but given their #2 followed suit, we re-jigged the board order giving Brian a match against their top player on shortened time controls. A really interesting match that ultimately went in favour of Alfil and Joshua John. Despite his young age, Joshua has been around for a few years now and is developing into quite the player. Against my King’s Indian Defence he made an aggressive advance of all his Kingside pawns at the expense of not developing his Kings Bishop and Knight. I fianchettoed both bishops and concentrated on solid piece development while he castled queenside and established a strong central pawn phalanx. Taking more time than my opponent, I calculated a way of breaking up his central pawns and temporarily sacrificing the exchange to win his f3 pawn, forking his two rooks to regain piece equality. I gained a second pawn at the expense of loosening my king-side pawn structure. He advanced his now-isolated pawn to d6 and threatened to swap queens and fatally invade my 8th rank with rook supported by pawn. By checking his exposed king I manoeuvred my queen back to defend against this, but he switched the focus to attack my cramped king position with queen and rook, and in time trouble on move 30 I allowed a fatal check on f7 which soon resulted in a loss. Nevertheless it felt better to play an exciting game ultimately lost, than win by default, since we still won the match. Brian. That’s us done in Division 4 now until the New Year. I’ll be in touch late run December to arrange the game for early Jan.
On the same evening as the London 4 team, our London 6 crew took on Hackney’s table-topping second team, Gorki. Hammer had a solid lineup – captain Rich up on board 1, Charlie Sturt on 2, Webmaster Andy on 3, and Nadim on 4. Last to finish was Andy on board 3, playing Thorne Snr (Chris, as he’s known!). An unusual game in many ways, notable for a lot of distractions but played in a great spirit & very enjoyable for both opponents. 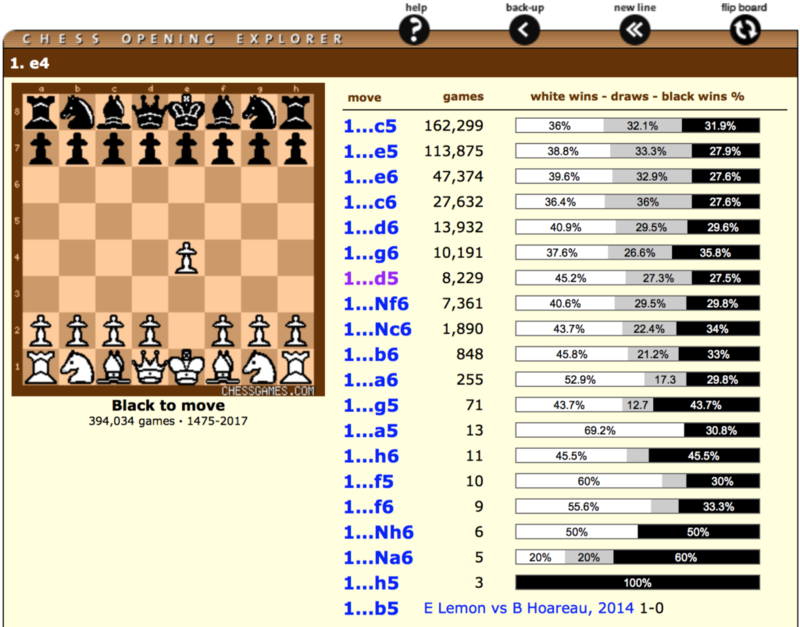 Two evenly-matched players, the game swung wildly with both players assuming the advantage at different times. Andy looked in peril approaching the endgame, but he held his cool, drawing a blunder from his opponent and exchanging Rooks, ending in a drawn position. At Hammersmith we pride ourselves on giving back to our members and the community – and this month sees us pickup the training baton in good style, with two sessions coming up from a couple of our top players. We’re really lucky in having strength in depth at the upper-end of our club these days, and we’re particularly lucky that some of the guys are happy to give up their time to help coach the rest of the club. Monday 20th November – stalwart & Middlesex 2 Captain Zeus (aka Marios) takes us through a session on the use of fianchetto structures. Marios has a pair of games utilising fianchetto that he’ll take us through, but if you have any other interesting games in your personal collection you’d like to see analysed, please drop him a note: m.kouis14@gmail.com . The session starts at 7.30pm and will run for a couple of hours. Huge thanks to both players for giving up their time! As usual these are both open sessions – anyone is free to attend, member or not! 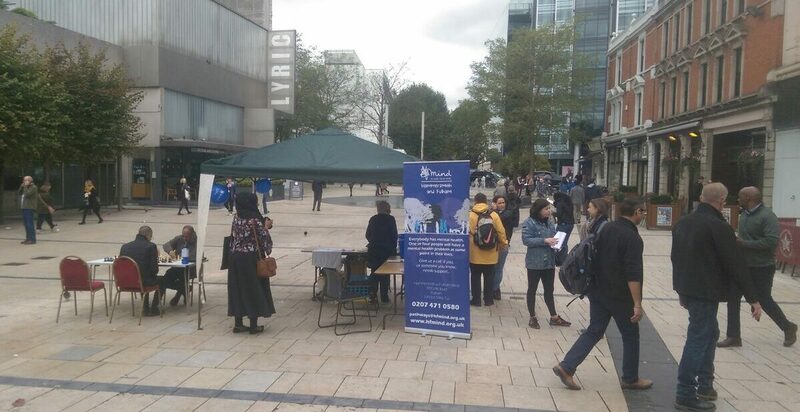 You may recall a small number of Hammer players answered the call to arms for World Mental Health Day recently, heading down to Lyric Square to partner up with our friends at Hammersmith & Fulham MIND. Our contact at MIND, Victoria kindly dropped us a note this week to thank our members for helping out. More importantly, the charity was able to raise over £500 on the day! Brilliant stuff, and we say a huge THANK YOU to those members who volunteered. 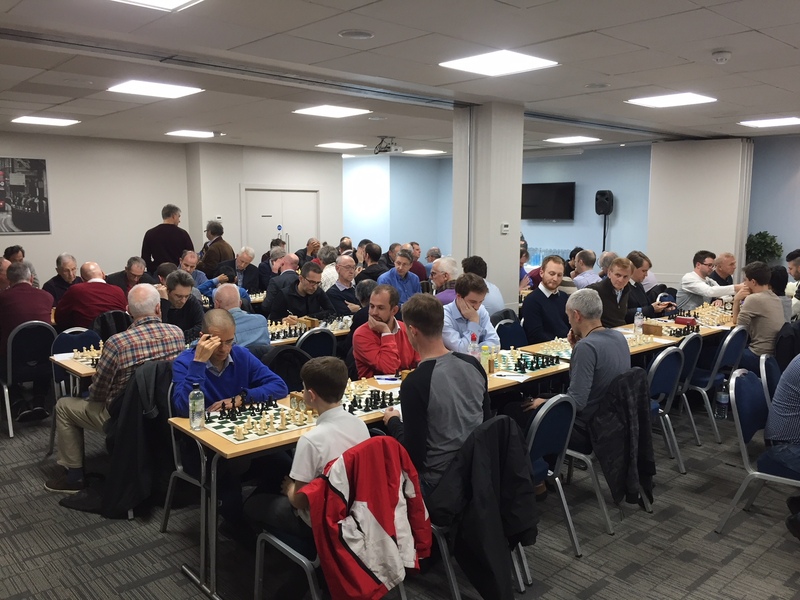 SAVE THE DATE – 11th December sees us host GM Keith Arkell for a Simultaneous at Lytton Hall on the final day of the London Chess Classic. We have limited places for this one, so you need to get in touch ASAP if you’d like to take part! There’ll also be a small board fee of £6 to enter. Simuls are always a cracking affair – not only do you get to play one of the world’s top players, but you can very often give them a close-run game! RapidPlay Round II – Reminder! We’re almost halfway through November, which means there’s only a couple of weeks left for you to arrange & play your Round II games in the new RapidPlay tournament. By now you should have at least arranged a date with your opponent – if not, you can find full details of your opponent here, or in your inbox. Get in touch, and agree a mutually agreeable date, time and location! Then it’s just a matter of playing the game and letting the controllers – Adam and Dave – know the result. Remember – if you fail to play the game by the end of the month, you’ll both default and score nil points! Save the date: this coming Monday our resident Italian gent, Matteo, is hosting an evening dedicated to the Caro-Kann, at The Albion. This will be one of our final nights at the Albion before moving back to Lytton Hall when the season proper begins later this month, and it is set to be a cracker. Matteo will be covering the main variations of the Caro-Kann defence, with the aim of showing how Black can always enter the middle game at least equal, if not ahead of White. The session will also cover the seemingly unfair reputation amongst players that the opening has as a “drawish” line. No matter your level, it will certainly be an in-depth session on the defence – perhaps particularly relevant for players at the lower end of the rating scale who may be unfamiliar with it. Prizes: 40% of the entry pot! 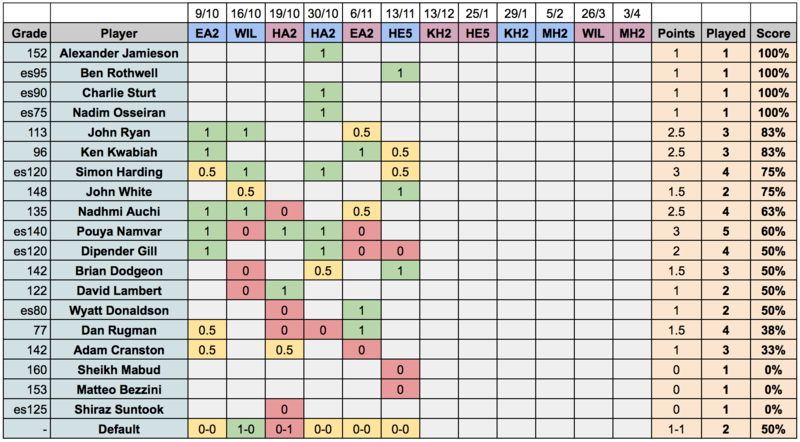 Looking at the last ECF grading list, the Hammer star turn has undoubtedly been Chris Moore, who has improved his grade over 2 years from 88 to 121, which means the Chris of 2017 would score 80% against the Chris of 2015 – if you believe the grading system! 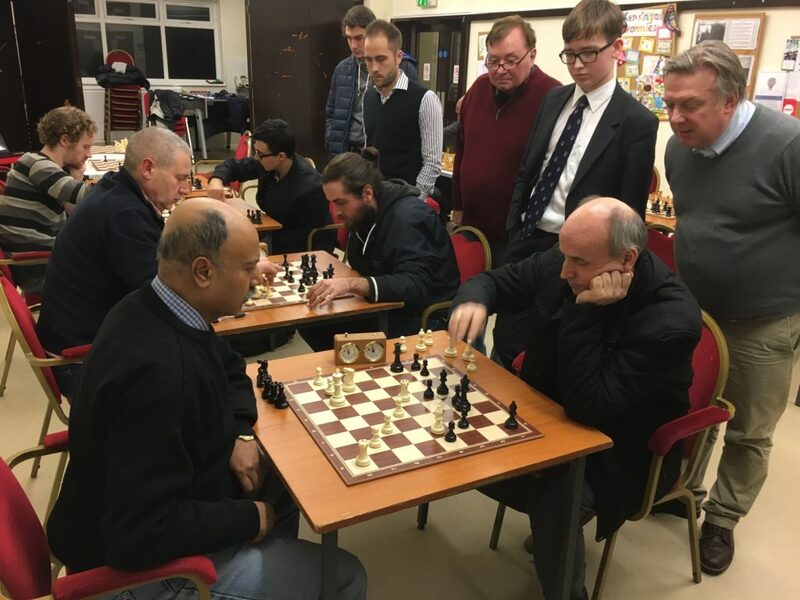 This is particularly interesting as Chris was in the same situation as a number of other new (and newish) members of the club, who have all played some social chess before and are certainly not beginners, but on the other hand are not used to facing experienced club players regularly. Chris has successfully bridged this gap in a short period of time, and in this session we will look at how his play has changed to achieve this, together with some suggestions regarding where he could look to improve further. 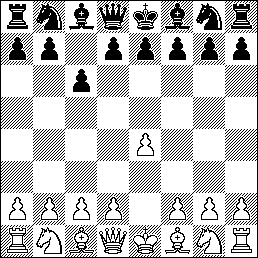 There will of course also be some concrete chess analysis, with a bit about opening theory and discussions of both positional and tactical themes. Our top player Carsten Pedersen (206) will be hosting the session – See you there! Author HammerPosted on July 15, 2017 Categories Club Updates, General Chess, Training & Theory2 Comments on C4, D4, or E4… that is the Question? Our Hammersmith Summer of Chess continues this coming Monday 3rd July with a team Rapidplay tournament at The Albion. The tournament will kick off just after 7.30pm, lasting until around 10pm, with each player assigned to one of four teams. Everybody will get to play three games against similarly-rated opponents on each of the other teams. Time control will be 20 minutes for all moves, with no increment, and the games will not be graded. It’s an open event – no need to pre-register, but latecomers should be aware that they may not be able to participate once the teams have been sorted and the first games have kicked off! Non-members and casual drop-ins are of course very welcome! Anyone not wanting to take part in the tourney is welcome to join us for the evening and play some regular blitz/casual chess on the side. Lastly, and most importantly… a mystery prize will be awarded to the winning team!! 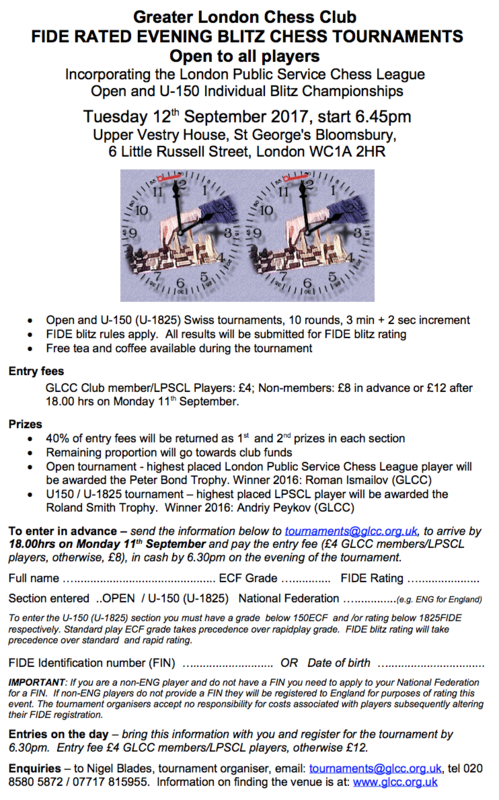 Come on down – should be a great evening of chess! 26.06.17 – The Albion Public House – Yes, the first training night of the Summer Program was delivered this Monday just gone by Clueless (aka. John White) – not a nickname to fill you with confidence – at our temporary Summer residence, The Albion. Using an illustrative game of mine, from just over two years ago, played against Ealing 2, I hoped to explore all of these themes. Please note, I will only examine the line played. You can have fun with all the variations and the what-ifs! One caveat to all of this is my own ability as a chess player. I can probably calculate three moves deep on a good day, but due to the amount of chess I have played I do have some feel for what is the right move in any given position. We join the game just as White, my opponent, had to seal his move. To the game, and I will supplement the move analysis with my thoughts at the time. The critical action took place over about 15 moves. White sealed Rh3 – I was relieved when it was played on the board. I was dreading Ba3 and a subsequent BxN. At this stage I deliberately waited 10 minutes before playing my next move, KxP. I wanted it to appear I was shocked by his move. He immediately banged out Kg3. Again, I took my time and thought for 20 minutes – this was part deliberate, as well as part trying to figure out what to play. I knew he was not playing his researched line, and I wanted to find something he and his engine had not considered. I reasoned that I wanted to keep as many pieces for now on the board, activate my pieces and prevent penetration by his Rook. The move I played, which I found at the board, allowed this to happen. I played Bf7. I played it with supreme confidence to rattle him. A bit of chess psychology. He visibly started; my ruse had worked. He thought for a while and continued with his original plan. Kg4 was played. I responded with Kg7 to prevent any Rook penetration along the h-file. He then banged out Ba3 – if you put it in the engines a mistake. I immediately played Nd7. His response was to play Bd6 to which I replied Rc3 and for the first time I felt the initiative had changed hands. He played Bb5 and I instantly replied Nf6+. I had achieved my goals set out when I played Bf7. This is where the tactics started with any King move other than Kf3 allowing a juicy Knight fork. He retreated with said move and I followed up with g5, threatening g4+ and picking up the Rook. He retreated his King to g2. Check out the move options for white here. I now felt slightly sadistic by playing Rc2+, driving him back to the first Rank. He played Kf1. Now consider the position – whose King has more space and whose pieces have real targets, and how vulnerable is White’s Queenside? Quite a transformation, and all in the space of 9 moves. In the next few moves the minor pieces were swapped off and White picked up the g-pawn. However, the commanding position of the Black King and the vulnerability of the White Queenside pawns decided matters in favour of myself. My opponent resigned many moves later – he did not shake hands and was totally bemused. He was beaten psychologically as he could not adjust to the change in events. All I can say is that revenge is a dish best served cold. This small section of the game decided matters and demonstrates all of the above themes. The use of psychology to unsettle your opponent. Doing something out of the ordinary. On a personal note, I find it unbelievable that we still allow adjournments in UK League Chess. In these days, when everybody is time precious, the extra costs involved and the use of chess programs makes the continued employment of the adjournment option ludicrous. I fervently believe this is the overwhelming view of most league chess players. We are being held back by a vociferous minority! We have to get with the times!! The results are in – they’ve been checked, double-checked, scrutinized to death, and independently verified. We can now proudly announce that the Winner of our first Puzzle of the Week is…. Well done Matteo!! Full puzzle and solution below. It was a great puzzle to start with, and easy to overlook Black’s pawn on the g-file, poised for promotion. 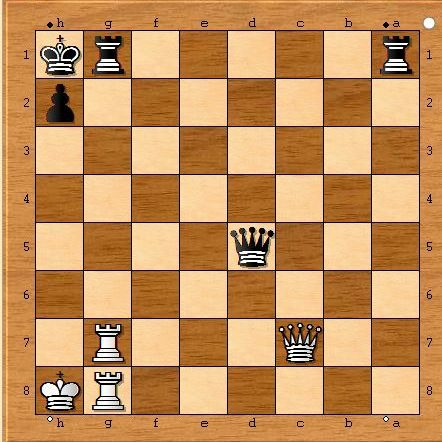 Solution: 1.Be6+ Kh7 2.Bg8+ Kh8 3.Bb3+ Kh7 4.Rxb7+ Kh8 5.Rb8+ Kh7 6.Bg8+ Kh8 7.Rxb1, then mate is inevitable. This week, we bring you two puzzles – the first of which is fiendishly tricky and may take you a while to figure out. The second is a little more straightforward. It’s White to move in both, and the target is Checkmate. As always, first to leave the correct solution takes the plaudits – good luck! Puzzle 2 – a little easier!